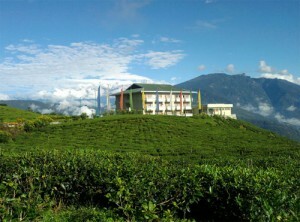 About Cherry Resort: Picture perfect in true sense of term, Cherry resort is an idyllic stop for romancing with nature. The resort welcomes tourists with all its warmth all through the year. All the rooms of the resort are generously sized and admired with a deck offering the panoramic views of the surrounding landscape. While resting on the deck, savor a steaming cup of tea, experiencing the summer monsoon. In a lazy afternoon, right from the verandah of this retreat, soothe your eyes with the flavor of green darkness all around. The golden sunrise over Mt. Kanchenjungha and the spreading light over the blooming Cherry Blossoms bring the heaven on earth every morning here. The incredible magnolia and rhododendron blooms in nearby forests also offer visual pleasure. The large deluxe rooms of the hotel are furnished with a lavish sitting area and decorated modern bathroom with shower and 24-hour hot water. The deluxe rooms also have access to the roof-top cafeteria. The dinner room offering splendid views of the tea plantation and blue mountains serve meal in an amiable ambience. The New Year celebration in the resort is a real excitement for all tourists. Facilities in Cherry Resort: The winning combination of superb facilities and unparallel hospitality is the essence of this resort. While in room, you can remain occupied with internet facilities offered by the hotel. Avail the international telephone call services to connect with your loved ones. 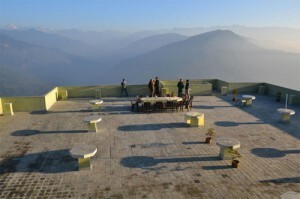 The resort also offers some recreational activities like badminton, cycling, carom etc. You can also enjoy a nature walk around the tea gardens. The destination is perfect for exploring the life in a tea estate from dawn to dusk. You can also visit the Tea processing factory located nearby. The hotel also arranges for Doctor on Call. Moreover, it also offers pick up and drop facilities from Airport or railway. The conference and special events facilities offered by the hotel truly deserve a special mention. The resort has some incredible arrangements for hosting conferences, indoor meetings and grand weddings. The resort can accommodate up to 500 people for private parties. Outdoor-tented events can accommodate around 1000 guests. Eco Tourism in Cherry Resort: Cherry Resort is committed in upholding the Eco tourism or eco values. That expertise and care translates into an enduring experience for the tourists visiting the resort. The hotel prepares an array of delectable and healthy dishes from fresh organic food nurtured by the pure Himalayan water. You can savour some mouthwatering Sikkimese traditional bites and sips to North Indian dishes coupled with Asian and continental specialties. The room décor of the hotel are also admired with local hand crafted furnishings. Whether you are a honeymoon couple or in a family holiday or an eco-adventurer, Cherry Resort will always try to meet your expectation. Nearby attractions of Cherry Resort: Tourists can organize trips from Cherry resort to the nearby attractions. 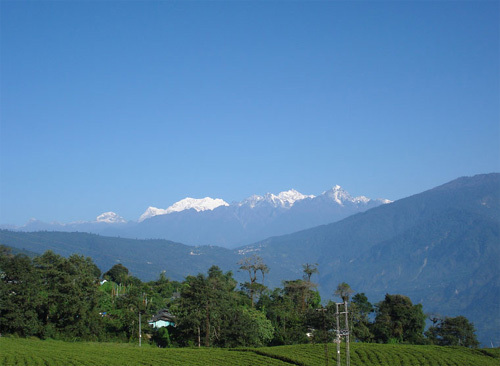 Pelling renowned for its unparallel natural splendour is located in the district of West Sikkim. Nestled at an altitude of 7200 feet, the location offers some panoramic views of the snow-capped peak of Mt. Kanchenjunga and other peaks of the Eastern Himalayas. The place also attracts tourists for viewing some of the oldest Buddhist monasteries in Sikkim, like the Pemyangtse Monastery and Sang Da Choeling Monastery. 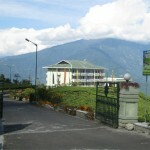 You can also visit Namchi, the capital of South Sikkim from Cherry resort. This major tourist attraction is located at an elevation of 1675 m above sea level. In Bhutia, the term Namchi means ‘Sky high’. This township is slowly gaining importance as a tourist destination. The place offers a majestic view of Mt. 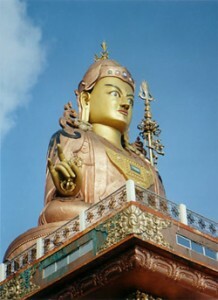 Kanchenjungha and its prime attraction is the colossal statue of Guru Padmasambhava in Samdruptse monastery. The upcoming Chaar Dhaam point also attracts bulk of tourists. 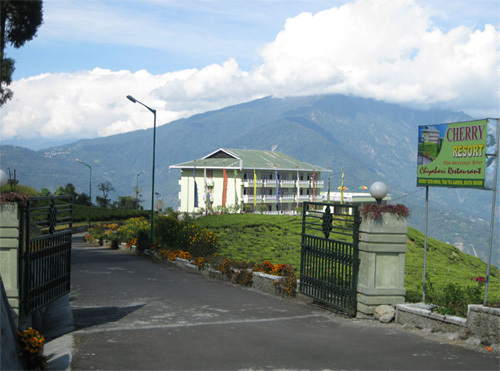 You can also visit the pristine hamlet of Ravangla in Sikkim, located at a height of 7000 ft. This place is also emerging as a natural tourist retreat, offering splendid snow view. Nestled in the South Sikkim District, this village is a perfect location for village tourism. The place admired with snowcapped mountains, spectacular tea gardens, exotic flora and fauna, old monasteries has all kind of potentials for becoming a tourist hotspot. Trekking routes to Tendong Hill and Maenam Hill also originates from Ravangla and nearby areas. Some other areas where day trips can be organized are Rimbi Waterfalls, Khecheopalri Lake, Rabdentse Ruins, Pemyangtse Monastery, Sewaro Rock Garden and Kangchendzonga waterfalls. How to reach Cherry Resort: Cherry resort is located at a four hours driving distance from Bagdogra airport. It takes around 3.5 hours to reach the destination from Siliguri.